About 2 month ago I was invited to Best Internet and beautiful Zagreb in Croatia to host a full day workshop on the future of communication. Me another 85 people had a great day where I mixed speaking sessions with, what I love the most, open discussions. 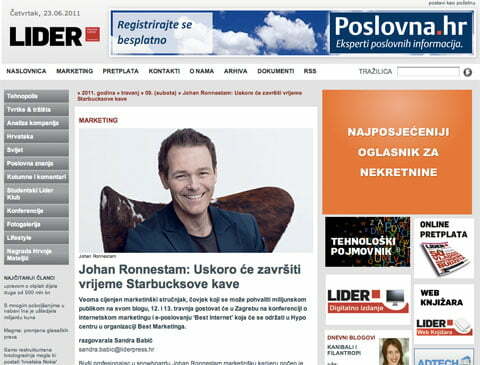 Before this event I was contacted by the leading business newspaper in Croatia – Lider. They wanted me to answer 10 questions that they would base an article on. Today as I was cleaning my desktop on my computer I thought – since you probably understand as much Croatian as I do I thought this could be a good blog post. So here we go. 1. Once you are on the internet your competition is whole world and people speak in one language (mostly english). How can local brands stay local or share national values while ‘living’ in virtual world? Johan Ronnestam: By being just that – Local. In a globalized world people will look for the unique brand that delivers something beyond what you can shop in every parts of the world, every country and every city. The times when we all wanted Starbucks coffee is soon to be over. Everyone who’s been traveling the last ten years recognize the feeling. You travel all over the world only to find the same brands you can shop for at home. Branding and marketing has always been about differentiation – and that’s why building on local uniqueness is the way forward. 2. You wrote that brand should offer value, not just sell, sell, sell…They should teach consumers some skills or just share knowledge. I agree, but how to explain it to CEO or CFO? What and when could they expect return on investment? Johan Ronnestam: First off. It’s really not that different from a non-digital world. The brands you wanna come back to are the brands that offer more than their product. Traditionally this used to be about well educated sales personel, customer magazines, cliniques and more. It’s time to move this knowledge online but with the understanding that online means transparency. It’s easier than ever to compare products and features. So – the online salesmen (sites) gotta focus on value over sales. Sales will follow. When it comes to return on investment I think the answer is long term growth in social networks, search and obviously brand recognition. The social and search part can easily be measured. The brand recognition is tough to isolate – but that’s always been the case. Hasn’t it? 3. Do we really know our consumers? I mean, which are the easiest ways to get to know them or test them? Johan Ronnestam: No we don’t. We tend to think we know our consumers but the consumer (if you even wanna call them that today) today is not the same as yesterday. People are more like chameleons. We tend to jump back and forth when it comes to identity. We simply don’t wanna be tagged. Online however we can really know what our visitors do and how they perform tasks. But don’t fall into the trap thinking you know who they are. A 18 year old guy from the suburbs wont react the same way twice. 4. What are your predictions concerning investment in internet as a media? What is going to happen with traditional media? Johan Ronnestam: In a near future I don’t think we’ll look at the landscape as a media landscape. We’ll look at it more as a formated landscape. What I mean with this is that TV commercial won’t be a TV commercial any more. A forced video message however will live on. We’ll always be in need of distributing messages containing products and brands that people never heard of – for that we can not rely on search, social media etc. Someone has to find it first. PR and ambassadors marketing will of course mean a lot for those kind of messages but there will always be a place for interrupted messages like the ones TV, Print and Outdoor deliver today. The effect of the digital revolution however is that the information gathering, the desire and even the sales part of the consumer journey will be digitalised and therefor transformed. 5. In Croatia experts talk about digital revolution, internet marketing campaigns etc, but still, none has the courage to invest or try those virtual project like those in western market. What should the do first (as beginners) and what are the things they should know before investing in internet communication? What are the biggest signals that market (consumers) are ready for that kind of communication? Johan Ronnestam: Prototypes. Experiments. Failure. Success. Meaning – you’ll have to mark a certain part of your media budget, not your production budget, for experiments that might lead you forward. The internet is unique in the sense that no two solutions are the same for two brands. You have to find your own way forward. One thing is for sure – as we’re seeing a shift in how people consumer brands we’ll also see new winners and losers on the market. The looses, as always when a behavior changes, will definitely be the ones that doesn’t welcome change. 6. How to boost traffic and where does it come from mostly? Johan Ronnestam: Great brands today and tomorrow are built on great products. If you got em’ people will find you. If you’re product doesn’t stand the competition. Start there. 7. You wrote that faces, copy and design are very important and warned that competitors are just click away. Can you tell us something about that? 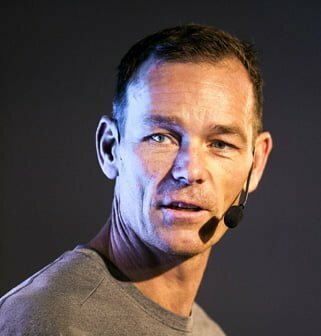 Johan Ronnestam: In the real world if you’ve found your way to a car dealer and everything doesn’t meet your demand it’s still for you to get into the car, drive for 30 minutes and find that next dealer. Online that click is just one step away. If your audience doesn’t get your design, understand your navigation, like your tone of voice he/she will type a new search into Google and move to the next brand. 8. What can we expect in future? Boom of conversational marketing? What about virtual advertising? 9. What are your thoughts on trend of branded web-series? Johan Ronnestam: If focused on value regarding the category in which their products exist – great. Otherwise mostly stupid. 10. Internet is all about speed…What about emotions? Johan Ronnestam: Technology and user interfaces is not what the brand is about. It’s merely the means to deliver the consumer experience of the product. So, photography, video and copy equals emotions. The actual websites however should focus on conversion, usability. By doing so you’ll end up having consumers feeling positive. 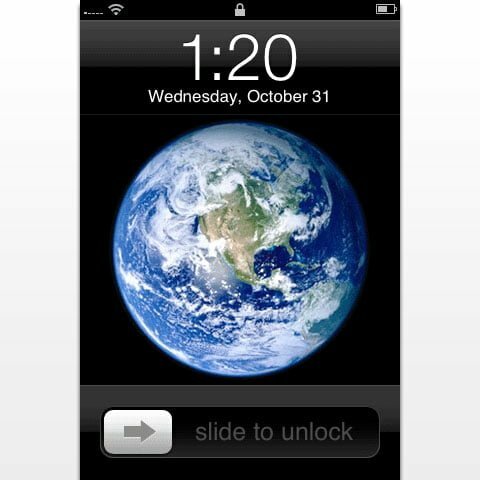 I think Apple proves that both can be achieved side by side. Your example about the 18 year old from the suburbs in the 3:rd answer is really revealing, and accurate. Seems to me that the demographic aspect of audiences is not that relevant these days. Much more rewarding to look at interconnecting behavior and interests around topics, products, society and so on. It’s the demographic of great that matters huh 🙂 Seems like great products make it through any layer of age, citizenship, language, behaviour etc. we must make good brand to promote. Consumer research is important to do.